Fans have been treated to killer artwork and an impactful sorcery spoiler card. Nicol Bolas is gearing up for the final battle on Ravnica with Magic: The Gathering’s newest expansion, War of the Spark. Containing 36 planeswalkers, revived zombie gods, and a host of powerful cards, it’s set to be released in MTG Arena at the end of April. 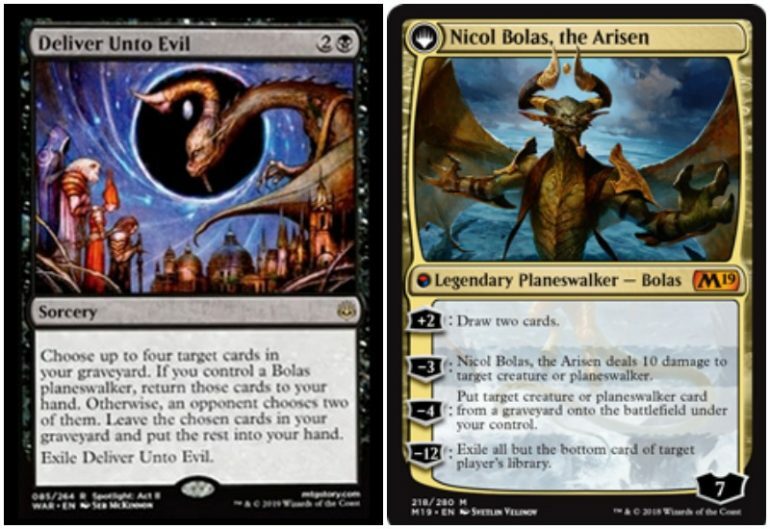 And the most recent War of the Spark spoiler, Deliver Unto Evil, will give decks with a Bolas planeswalker in them a boost. 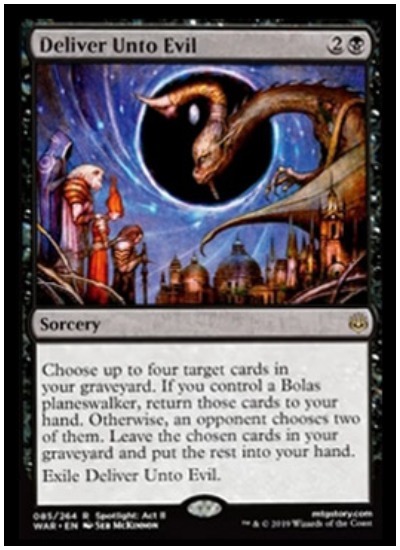 Deliver Unto Evil is a three mana (one black) sorcery card with possibly the best artwork released thus far in the War of the Spark spoilers. Its ability is pretty good, too—especially when put into a deck with a Nicol Bolas planeswalker. Deliver Unto Evil might be a good fit for a Commander deck with Bolas as the lead. It will also possibly work in a Super Friends, Grixis Dragon, or a Bolas control deck. Deliver Unto Evil is cheap and effective, even if Bolas isn’t in play. Getting two, instead of four cards, back into the hand from the graveyard for three mana is a good deal. Plus, there are no restrictions on getting copies of the same card. Overwhelmed and impressed by the artwork (Seb McKinnon), fans are calling for it to be used on an MTG War of the Spark playmat. The new Magic: The Gathering expansion is set to go live in MTG Arena on April 27 and in card form on May 3.